An Antichrist Obama in McCain Ad? 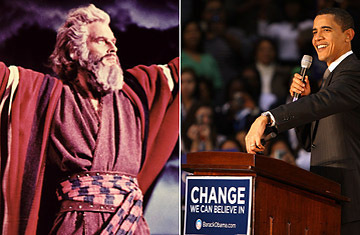 Charlton Heston as Moses in The Ten Commandments, left, and presidential candidate Senator Barack Obama. It's not easy to make the infamous Willie Horton ad from the 1988 presidential campaign seem benign. But suggesting that Barack Obama is the Antichrist might just do it. That's just what some outraged Christian supporters of the Democratic nominee are claiming John McCain's campaign did in an ad called "The One" that was recently released online. The Republican nominee's advisers brush off the charges, arguing that the spot was meant to be a "creative" and "humorous" way of poking fun at Obama's popularity by painting him as a self-appointed messiah. But even this innocuous interpretation of the ad  which includes images of Charlton Heston as Moses and culled clips that make Obama sound truly egomaniacal  taps into a conversation that has been gaining urgency on Christian radio and political blogs and in widely circulated e-mail messages that accuse Obama of being the Antichrist. Two months ago, Vanderslice founded a Democratic PAC called the Matthew 25 Network and soon noticed that the negative e-mails she received from conservative Christians fell into two general topical categories: abortion, and the assertion that Obama is the Antichrist. The cataloging of similarities Obama shares with the Antichrist began nearly two years ago. But it picked up steam in February 2008 after he racked up a string of impressive primary victories. A Google search for "Obama" and "Antichrist" turns up more than 700,000 hits, including at least one blog dedicated solely to the topic. A more obscure search for "Obama" and "Nicolae Carpathia" yields a surprising 200,000 references. It's not hard to see how some Obama haters might be tempted to make the comparison. In the Left Behind books, Carpathia is a junior Senator who speaks several languages, is beloved by people around the world and fawned over by a press corps that cannot see his evil nature, and rises to absurd prominence after delivering just one major speech. Hmmh. But serious Antichrist theorists don't stop there. Everything from Obama's left-handedness to his positive rhetoric to his appearance on the cover of this magazine has been cited as evidence of his true identity. One chain e-mail claims that the Antichrist was prophesied to be "A man in his 40s of MUSLIM descent," which would indeed sound ominous if not for the fact that the Book of Revelation was written at least 400 years before the birth of Islam. The speculation reached a fever pitch after Obama's European trip and the Berlin speech in which he called for global unity. Conservative Christian author Hal Lindsey declared in an essay on WorldNetDaily, "Obama is correct in saying that the world is ready for someone like him  a messiah-like figure, charismatic and glib ... The Bible calls that leader the Antichrist. And it seems apparent that the world is now ready to make his acquaintance." The conservative website RedState.com now sells mugs and T shirts that sport a large "O" with horns and the words "The Anti-Christ" underneath. Even if a fraction of the Internet-using public engages in outrageous Antichrist speculation, feeding those extreme beliefs wouldn't seem to be an obvious political strategy. But McCain advisers are aware that one of the goals of Democratic outreach to Evangelicals has been to simply neutralize their opposition. "You just have to take the edge off," says Michigan Democratic Party chair Mark Brewer, explaining why he spent much of a 2006 meeting with conservative pastors around his state. "Now that they've met me, they can see I don't have two horns and a tail." A new TIME poll finds that the most conservative Evangelicals are the least enthusiastic about McCain's candidacy. Convincing them that Obama does have two horns and a tail might be the best way of getting them to vote. That's what worries Campolo, who also sits on the Democratic Party's platform committee. "Those books have created a subliminal language, and I think judgments will be made unconsciously about Barack Obama," he says. "It scares the daylights out of me."